It’s not everyday that maximum-security inmates brush up against Grammy winners — or earn nominations themselves. 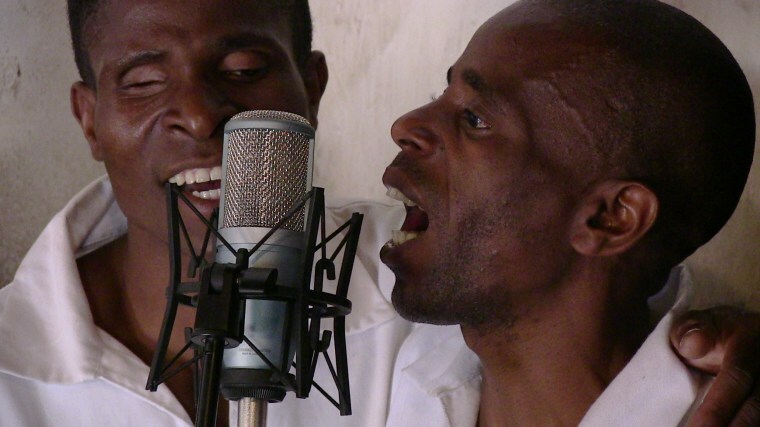 A group of inmates at Malawi’s Zomba Prison scored a surprise nod in the Best World Music Album category. "It’s certainly beyond anyone's expectation," the album’s producer, Ian Brennan, told NBC News. He said the album, “I Have No Everything Here,” was borne out of a desire to give voice to the voiceless — and the Grammy nomination is the ultimate validation. "This means we've been heard. And that’s shocking," Brennan added. "The motivation was in trying to help represent underheard populations,” he explained. Going into a prison, he added, “seemed like a good way to do that." "There's tremendous power in what they’ve done"
The Grammy-winning producer gained access to Zomba Prison for him and his wife in exchange for offering classes on violence prevention to inmates and guards; the conditions they encountered were horrible. The decaying brick prison — built in the colonial era to accommodate around 300 inmates — held more than 2,000 prisoners. "There are rats, there's cockroaches, there's obviously mosquitoes and tarantulas," he said. "It's not an easy environment. It's overcrowded." The women were locked in from 4 p.m. until dawn without access to a toilet. Food shortages affected both male and female prisoners. Still, Brennan noted, the conditions were not far off from those seen outside the prison’s walls: Malawi consistently ranks among the poorest countries in the world. Brennan said such challenging conditions can bring out the worst but also the best in inmates — along with incredibly powerful music. "If you gather any random 2,000 people together there’s going to be some good singers and some good musicians," he explained. "There is music everywhere." The prison had an organized band for the men, who had access to guitars, drums and a keyboard. The women, though, only had two small hand drums and buckets which they’d use while singing and dancing to "pass the time and lift their spirits." Many of the inmates were serving time for murder, though others were in the maximum-security prison for crimes such as theft. Some had been living inside the prison for longer than they’d been outside its walls. Brennan said many were working to rehabilitate themselves. "I'd have to dig deeper into the English language to describe how profound the sadness you see in these individuals is," Brennan said. "It permeates their eyes and their skin and their breath. It's a heavy thing." Making music, he said, is "definitely cathartic." They recorded more than six hours of music with around 60 inmates ranging in age from 22 to 70. The 20 tracks which made the album — mostly in the Chichewa language — "speak for themselves," reflecting universal themes of loss and incarceration. "I See the Whole World Dying of AIDS;" "Don't Hate Me;" "Give Me Back My Child;" "I Kill No More;" "Please, Don't Kill My Child;" "I Am Alone," and the second-to-last track: "Forgiveness." The album drew it's title — "I Have No Everything Here" — from a note one prisoner, jailed for life for murder, snuck to Brennan begging for more help. "It was very touching," he recalled. "So poetic I broke down crying." The album was recorded in just under two weeks in August of 2013 and released in January 2015. Some of the performers have since been released; one died in prison. It will go up against Angelique Kidjo, Ladysmith Black Mambazo, Anoushka Shankar and Gilberto Gil — all of whom have previously have won or been nominated for Grammys — at the Feb. 15, 2016, awards. Win or lose, Brennan said the Zomba Prison Project already has been a success and praised the Recording Academy for taking note. "There's no reason in the world this should get a nomination — it's from Malawi, it's unknown individuals from a prison singing in a foreign language," Brennan told NBC News. "Somehow this emerged and connected with people… This is the Grammy Awards at their best, at their most noble…. It's a wonderful thing." It took around a week for word to get through to the prisoners that they had been nominated. Brennan hopes the nomination helps to clear the way for more music — from Malawi and also from the prisoners, the underrepresented.